A very neat feature that PWM (pulse with modulation) offers is being able to control the brightness level of LEDs. By varying the duty cycle percentage, we can control the exact brightness of any LED. 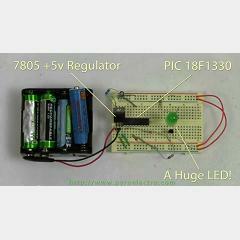 This article takes you through a simple example design step-by-step using a PIC microcontroller. The end result is an LED controller that can set an LED to 100 unique brightness levels. I interestingly red.You have explain step by step clearly but the main part is not explained.you have explain in 2,3 places about diagram & components but those can easily understand,when come to coding (main main interesting part)nothing is explained so I lost the interest.Please be kind enough to explain the coding otherwise this article will be useless for beginners.